The party rockers - uncle Redfoo (Stefan Gordy) and his nephew SkyBlu (Skyler Gordy) - will open for the Queen of Pop at her London Hyde Park show on July 17, after performing with her at America's Super Bowl show. "Madonna's the female LMFAO. It feels so great to be accepted by the pop world," SkyBlu told the Daily Star. "We always wanted to be compared to people like Madonna. She entertained the world whether it was a movie, her live shows or her records.That is what LMFAO do." The award-winning duo are planning to make their own rock opera to rival Prince's Purple Rain. "For the next album, we want to make a movie, our Purple Rain. 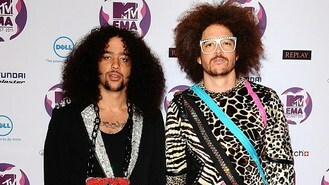 We talked about it a lot and it feels right now," added Redfoo.